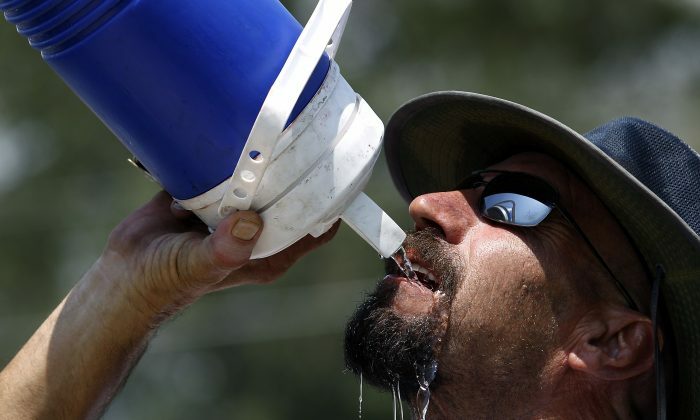 The National Weather Service predicts heat index values of up to 110 degrees this weekend. The agency issued an excessive heat warning that started this afternoon and lasts until Sunday evening Aug. 14 at 10:00 p.m. It is predicted to get hottest mid to late afternoon. The heat index measures how hot the weather feels by factoring in the temperature with the relative humidity. Middletown is predicted to have high temperatures of 92 degrees on Saturday and 90 degrees on Sunday, with humidity of 73 percent and 71 percent. Drink more fluids; don’t wait until you are thirsty to drink. Avoid alcohol and caffeine which dehydrate the body. Wear lightweight, light-colored clothing. Light colors reflect away some of the sun’s energy. Wear a wide-brimmed hat or use an umbrella. Always use sunscreen with a SPF of 15 or higher. Eat small meals and more often. Slow down. If you must engage in strenuous activity, do it during the coolest part of the day, usually between 4 and 7 am. When temperatures are extreme, stay indoors, ideally in an air-conditioned place. Never leave anyone, a person or animal in a parked vehicle. Heat exhaustion symptoms—headache, nausea, dizziness, cool and clammy skin, pale face, cramps, weakness, profuse perspiration. First Aid—move to a cooler spot, drink water with a small amount of salt added (one teaspoon per quart). Without Intervention—it can lead to collapse and heatstroke. Heatstroke occurs when perspiration cannot occur and the body overheats. Heat stroke symptoms—headache, nausea, face flushed, hot and dry skin, no perspiration, body temperature over 101°F, chills, rapid pulse. First Aid—cool person immediately, move to shade or indoors, wrap in a cool, wet sheet, get medical assistance. Without Intervention—it can lead to confusion, coma, and death. The Department of Homeland Security suggests preparing an emergency kit, making a family communications plan, and getting trained in first aid in order to treat any heat related illnesses. The department also lists potential illnesses and their level of severity. Heat cramps are the least severe. Heat cramps occur when the muscles experience pain and spasms due to heavy exertion in high heat. They aren’t dangerous but signal that the body is starting to have trouble dealing with the temperature. Heat exhaustion is more serious. The body loses too much fluid through sweating, paired with increased blood flow to the skin. This means less blood flows to the vital organs, potentially leading the body to feel a mild form of shock. If heat exhaustion isn’t treated, heat stroke can follow. Heat stroke, also called sun stroke, is when the body is not properly managing its internal temperature, sweating stops, and a life-threatening condition occurs. Brain damage and death can result if the body isn’t cooled quickly.